Infor VISUAL Support Tips & News: Did you know you can begin Forecasting Cash with just a few entries using VISUAL’s Cash Management Window? 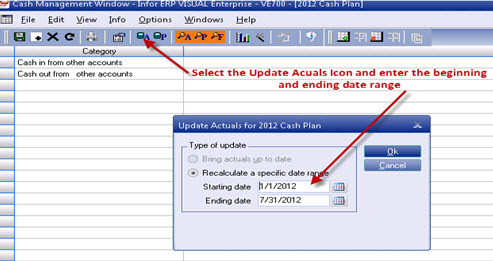 Did you know you can begin Forecasting Cash with just a few entries using VISUAL’s Cash Management Window? Go to VISUAL Main Menu | Cash | Cash Management window to begin. 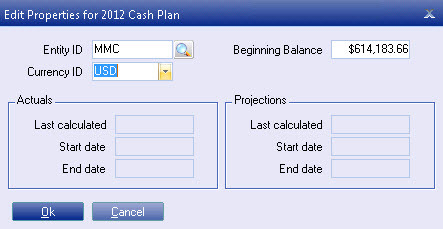 When you open the Cash Management Window, you will be presented with dialogue box that asks you to select a Cash Plan. 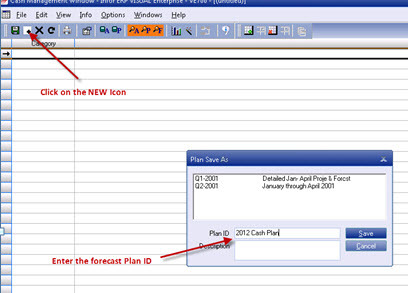 If you do not have a cash forecast and Plan ID set up, you will need to create one by clicking on the NEW Icon, and then enter your Plan Id in the dialogue box. Press Save. You will begin by setting up two “default” lines, one to report all the Outgoing Cash Transactions, and another to report all the Incoming Cash Transactions. This is all you will need to start- as all incoming and outgoing transactions will be reported on these two lines when you update the forecast window with actual transactions. Begin by selecting the Category Wizard Icon. You will be presented with a dialogue box. Select the Outgoing Cash option and press NEXT. Choose “Default Category for Other Accounts” then press NEXT and then press APPLY. After you press APPLY, VISUAL inserts the category line into the forecast table. Next, you insert a line using the Add Line Icon and repeat the process selecting Incoming Cash. Once you have added the two default accounts, the Cash Forecast screen looks as follows. You are now ready to enter your beginning Cash Balance and Update Actuals. Next, go to Options | Properties and the following dialogue box appears. Enter your beginning cash balance and the Entity code and Currency code. Press OK.
Next, we will update the Cash Forecast Window with the Actual Cash transactions that have occurred to date. Select the Update Actuals Icon and enter the appropriate date range. Press OK. VISUAL will populate all the cash activity into the two default lines. 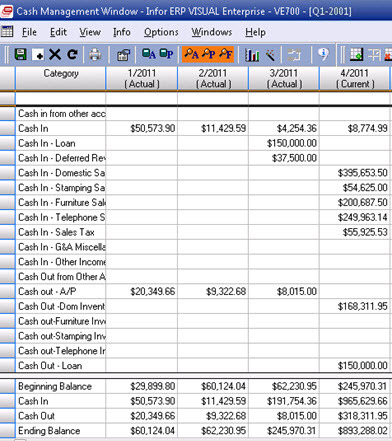 Next you can begin adding additional lines to identify the specific accounts that will provide and use cash. At this point, you will need to refer to the On-Line Books and/or help text to complete the forecast, but hopefully this will get you started. When you add the additional accounts, your forecast should look something like the one below. This Infor VISUAL Tip was brought to you by BizTech VISUAL Consultant, Joe Horvath. What's New with Infor VISUAL?